Microbial remediation services specializing in HVAC units, air conveyance systems, microbial remediation, industrial ovens, industrial exhaust systems, conveyors & dust collection systems. NADCA, IAQA, IKECA & EAA certified. Provide services in mold remediation, HVAC duct cleaning, mold inpection for residential & commercial buildings & dry ice blasting. Mold Removal & Microbial Remediation Services For A Variety Of Industries. Also Offers Indoor Air Quality Remediation Services. Manufacturer of an additive for making plastics bidegradable plastics using PS, PET, PP, PE and PVC. Microbial & Asbestos Abatement Services. Elimination of industrial waste using biotechnology, bioremediation services including site assessment, bioremediation feasibility testing, biological treatment of solid waste, biological sludge reduction, & design of microbially-enhanced wastewater treatment systems. suppliers of microbes and standardized bacteria for the bioremediation of pond water, hydrocarobons, ammonia and wastewater treatment systems. The goal in bioremediation is to stimulate microorganisms with nutrients and other chemicals that will enable them to destroy the contaminants. The bioremediation systems in operation today reply on microorganisms native to the contaminated sites, encouraging them to work by supplying them with the optimum levels of nutrients and other chemicals essential for their metabolism. Thus, today's bioremediation systems are limited by the capabilities of the native microbes. However, researchers are currently investigating ways to augment contaminated sites with nonnative microbes-including genetically engineered microorganisms-specially suited to degrading the contaminants of concern at particular sites. It is possible that this process, known as bioaugmentation, could expand the range of possibilities for future bioremediation systems. Regardless of whether the microbes are native or newly introduced to the site, an understanding of how they destroy contaminants is critical to understanding bioremediation. 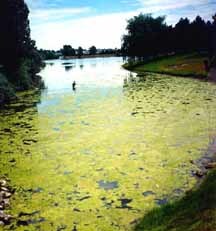 The types of microbial processes that will be employed in the cleanup dictate what nutritional supplements the bioremediation system must supply. Furthermore, the byproducts of microbial processes can provide indicators that the bioremediation is successful. Microorganisms gain energy by catalyzing energy-producing chemical reactions that involve breaking chemical reactions that involve breaking chemical bonds and transferring electrons away from the contaminant. The type of chemical reaction is called an oxidation-reduction reaction: the organic contaminant is oxidized, the technical term for losing electrons; correspondingly, the chemical that gains the electrons is reduced. The contaminant is called the electron donor, while the electron recipient is called the electron acceptor. The energy gained from these electron transfers is then "invested", along with some electrons and carbon from the contaminant, to produce more cells. These two materials � the electron donor and acceptor � are essential for cell growth and are comply called the primary substrates. Many microorganisms, like humans, use molecular oxygen (O 2 ) as the electron acceptor. The process of destroying organic compounds with the aid of 0 2 is called aerobic respiration. In aerobic respiration, microbes use 0 2 to oxidize part of the carbon in the contaminants to carbon dioxide (C0 2 ), with the rest of the carbon used to produce new cell mass. In the process the 0 2 gets reduced, producing water. Thus, the major byproducts of aerobic respiration are carbon dioxide, water, and an increased population of microorganisms. Many microorganisms can exist without oxygen, using a process called anaerobic respiration. In anaerobic respiration, nitrate (NO 3 - ), sulfate (SO 4 2- ), metals such as iron (Fe 3+ ) and manganese (Mn 4+ ), or even CO 2 can play the role of oxygen, accepting electrons from the degraded contaminant. Thus, anaerobic respiration uses inorganic chemicals as electron acceptors. In addition to new cell matter, the byproducts of anaerobic respiration may include nitrogen gas (N 2 ), hydrogen sulfide (H 2 S), reduced forms of metals, and methane (CH 4 ), depending on the electron acceptor. Petroleum hydrocarbons and their derivatives are naturally occurring chemicals that humans have exploited for a wide range of purposes, from fueling engines to manufacturing chemicals. The representative types of petroleum hydrocarbons and derivatives are gasoline, fuel, oil, polycyclic aromatic hydrocarbons (PAHs), creosote, ethers, alcohols, ketones, and esters. Each of these chemicals has a broad range of industrial applications. For example, PHAs are released when crude oil is refined and from the manufacture of petroleum products such as plastics. Creosote is used in wood preservatives. Ethers, esters, and ketones are components of chemicals ranging from perfumes, to anesthetics, to paints and lacquers, to insecticides. They are relatively soluble compared to other common contaminants and other gasoline components. They can serve as the primary electron donor for many bacteria widely distributed in nature. They are rapidly degraded relative to other contaminants. The bacteria that degrade BTEX grow readily if oxygen is available. Halogenated aliphatic compounds are compounds built from straight chains of carbon and hydrogen with varying numbers of hydrogen atoms replaced by halogen atoms. Halogenated ailphatics are effective solvents and degreasers and have been widely used in manufacturing and service industries, ranging from automobile manufacturing to dry cleaning. Some highly chlorinated representatives of this class, such as tetrachloroethene, are completely resistant to attack by aerobic microbes but are susceptible to degradation by special classes of anaerobic organisms. In fact, recent evident shows that certain anaerobes can completely dechlorinate tetrachloroethene to the relatively nontoxic compound ethene, which is readily decomposed by aerobic microbes.